Alexander Hamilton was one of the most influential figures in United States history—he fought in the Revolutionary War, helped develop the Constitution, and as the first Secretary of the Treasury established landmark economic policy that we still use today. Cut down by a bullet from political rival Aaron Burr, Hamilton has since been immortalized alongside other Founding Fathers such as George Washington and Thomas Jefferson—his likeness even appears on the ten-dollar bill. 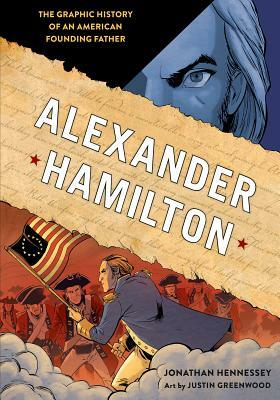 In this fully-illustrated and impeccably researched graphic novel-style history, author Jonathan Hennessey and comic book illustrator Justin Greenwood bring Alexander Hamilton’s world to life, telling the story of this improbable hero who helped shape the United States of America. JONATHAN HENNESSEY is the author of three previous nonfiction graphic novels, The United States Constitution, The Gettysburg Address, The Comic Book Story of Beer, and The Comic Book Story of Video Games. He is also the writer of the history-based time travel series Epochalypse. Based in Los Angeles, he works in film and television. JUSTIN GREENWOOD is a Bay Area-based comic book illustrator known for his work on creator-owned comic book series like The Fuse, Stumptown, Wasteland, and Resurrection. eagerly eat it up. . .worthy of high praise." ". . . a timely portrait of the famous and controversial Alexander Hamilton." "For fans of the stage show who are looking to dive deeper into the real history that inspired it, Alexander Hamilton: The Graphic History Of An American Founding Father is just what you need on your TBR." It’s amazing and cool and has a baller look. Have your mind blown by Hennessey / Greenwood. It’s the best Hamilton since L.M. Miranda." "Cramming an entire life into a single graphic novel—especially a life as full as Hamilton's—is no mean feat, but Hennessey is up to the task. Greenwood's engaging art, aided by Simpson's color, brings the pages to life with a vibrant energy." "This book needs to be in schools and on your shelves. Hennessey knows his Hamilton history and Greenwood’s art has a pulse that makes the founder's story as compelling for comics as it is for great theatre."